Home » Back to School » Controversial ideas in sleep health: Naps for high schoolers… Yay or Nay? Should nap time be an option that high schoolers use to prevent sleep debt? In the last few years, the rise of awareness about sleep deprivation among our teens has been a primary focus for those campaigning for later bell times for high schoolers. But some school districts, teachers, and parents have pitched a different kind of solution: nap periods in high school. These time slots during the school day would set aside opportunities for kids to catch up on sleep between classes, during natural break periods, or as an open offering on an individual basis for kids in most need of a snooze. Grabbing a quick nap there (rather than face down on their desk in class, which can be disruptive) has allowed sleepy teens in that district ta quick recharge that improves their focus once they return to class. Christopher Lindholst, CEO of Restworks, the company providing the pods to the high schools in Las Cruces, confirmed an increase in email requests over the last two years by administrators from high schools in the US and abroad who wish to install nap pods on their campuses. Another approach by some schools involves “nap clubs,” which are defined as time set aside during the day when all students may opt to attend specifically to nap. “Think of it as a productive, restorative recess,” writes Teen Vogue contributor Marissa Miller. An article in edCircuit reminds us that midday siestas, even during school, are the norm in many other countries, not just for preschoolers, but for people of all ages. What does SHC think about high school nap periods? Planned, short naps can be a healthy way to recharge the circadian rhythms. However, longer unplanned naps meant to relieve daytime fatigue can also be symptomatic of untreated sleep disorders. It’s always important to understand the reason why a person (at any age) needs to nap in the afternoon, because daytime sleepiness is the first red flag physicians consider when investigating the possibility of undetected sleep disorders in their patients. Having nap pods available for students to use on an as-needed basis makes sense. 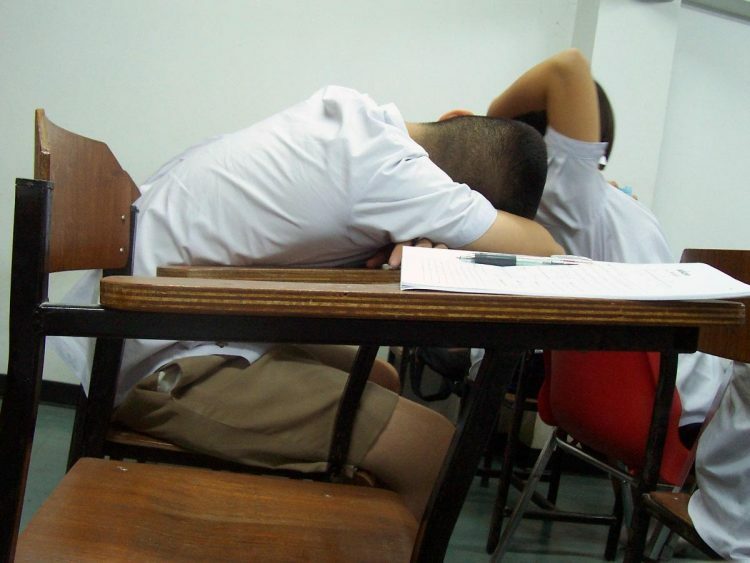 If students are so sleep deprived that they fall asleep in class, they are better off taking a quiet nap away from class to catch up on lost Zzz. School nurses appear to be in charge of these options. If these as-needed naps help students manage fatigue (or anxiety), then SHC thinks the nap pod is a good solution. Planned nap periods (like kids enjoy in preschool and kindergarten) aren’t a bad idea either, as long as there’s a way to make the sleeping environment comfortable and free of distractions. With school districts being cash-strapped, the investment of nap pods for everyone is highly impractical, but if students are allowed to bring a pillow or blanket with them, that might be one way to make it work. Hygiene issues could become a related problem, however. Lice and bedbugs are increasingly a nuisance. But if a district cannot afford to start their high school programming later, this might be the next-best (if imperfect) solution. Of course, the bigger problem is sleep-deprived teens, and starting school later has been shown to significantly improve overall health and performance of high schoolers because their school schedules are based on circadian rhythms unique to adolescents. Better sleep hygiene at night, less screen use late into the night, and smarter choices about using caffeine to boost alertness (by skipping caffeine in the afternoons) could also be more firmly enforced practices for teens who are consistently sleepy during the day. Is setting aside nap time for high school teens a worthwhile solution for addressing the widespread problem of teen sleep deprivation?